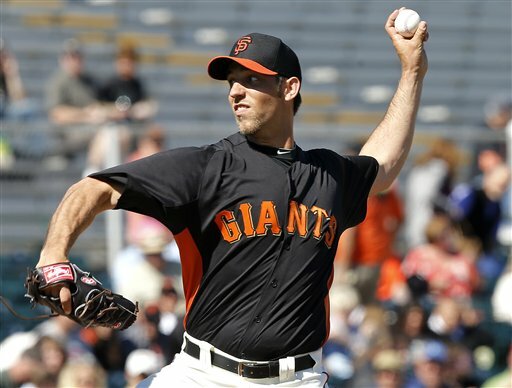 SF Giants pitcher, Madison Bumgarner, pitches two terrific scoreless innings in Spring Training. The San Francisco Giants open their spring training season with a game against the Los Angeles Angels on Feb. 23. Giants pitcher, Ryan Vogelsong, started the season by pitching two innings. The Angels scored first but the Giants rallied back, ending in a 4-1 victory. The Giants’ second spring training game was on Feb. 24 against the Chicago Cubs. Unfortunately, a line drive came back and hit Giants starting pitcher Matt Cain, limiting him to one inning. The Giants lost 4-3 to the Cubs. Giants left hander, Madison Bumgarner, trotted on the field with the team to face the Chicago White Sox in their third spring training game on Feb. 25 in Scottsdale, Arizona, and pitched two scoreless innings. In the second inning, the Giants led the White Sox 3-0, and scored six more runs in the third to lead 9-0. In the sixth inning, the White Sox score two runs to get them closer with the score of 9-2. In the eighth, everything changed and the White Sox started to pound the baseball. They came back from a seven point lead to tie the game 9-9. Because no extra innings are played in spring training, the score remained a tie. In the next game, Feb. 26, the Giants will face their rival the Los Angeles Dodgers.